I don't usually post twice in one day, but this activity is too cute. 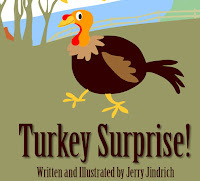 Turkey Suprise! by Jerry Jindrich at Chateau Meddybemps is a short story about a turkey hiding from the family on the farm. Incorporate spatial concepts, pronouns, WH questions, present progressive tense and/or your student's target phonemes into a lesson using this on-line story. Thanks for suggesting ways to use Turkey Surprise! to help children develop speech and language skills. Meddybemps.com is dedicated to making useful learning aids available to the teachers and parents of young children. It is rewarding to learn how our content can be used.